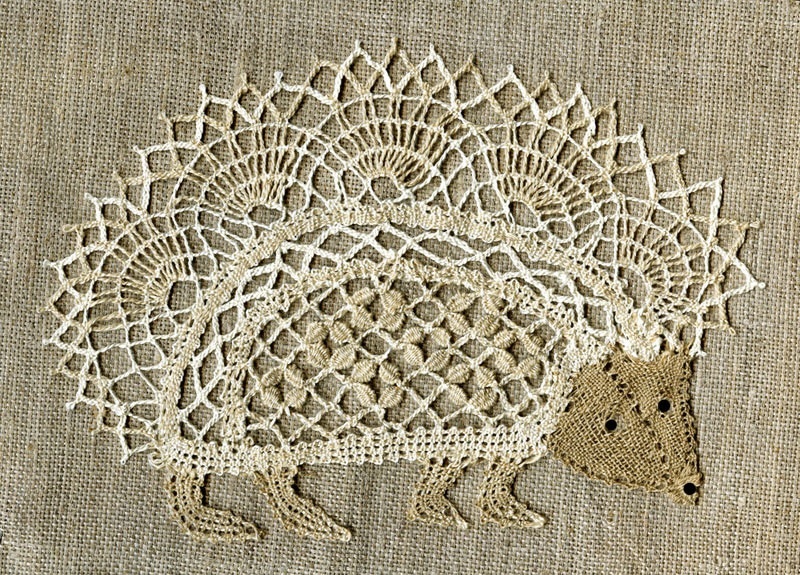 Jo Edkins’ Bobbin Lace School: A Bobbin Lace Hedgehog (an sca-like whimsy, not necessarily historical). Lace-Making was such a lucrative past-time in our period of study that young ladies with that talent once were financially independent. No wonder the Catholic Church used to claim that lace was an immoral addition to the wardrobe. Its use encouraged women to make a living for themselves without the help of men! Nowadays, we tend to consider it frilly and girly. I may need to rethink that attitude in light of that Feminist discovery. Shakespeare himself spoke to the well-known popularity of women and their bobbins (each thread in the pattern is wound on its own little elongated spool, or bobbin) in his play, Twelfth Nigh, that he referenced “…free maids that weave their threads with bones.” Some early bobbins have been found by collectors that were made of spindle-shaped bones such as chicken thigh bones. Nowadays, those spindled bobbins are objects of art all by themselves. Many web pages that pop up on top of your internet searches which speak to lace history are the result of insufficient and shoddy research. Many of those repeat (plagiarize much?) the same exact and incorrect text. Therefore, if you read elsewhere that Bobbin Lace, today’s topic, was invented in the 1500s, please ignore such reckless scholarship. Lace as a whole has been with us a very long time. Lace Bobbins, particularly historic ones, are a current subject of European collector’s fever, and a great many have been found that predate the 1500’s publication of the earliest how-to manual for bobbin lace (see one good lace-bobbin scholarship paper here, and the historic lace pattern book, Le Pompe, here). Lace in general is a great deal older than the Renaissance, and the use of bobbins to organize the threads of complicated patterns must surely predate the height of bobbin lace use. 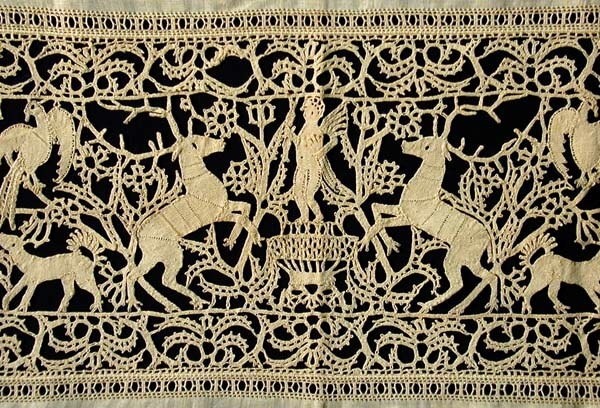 We know, as far as lace history is concerned, that ancient Egyptians had an appliqué process for decorative knotted thread, as did the Vikings, whose technique of gold- or silver-wire or colored thread lace-like appliqué was called posament. Mankind’s quest for sumptuous adornment has more to do with the development of bobbin lace than the average Tudor-era seamstress looking for yard goods. Regardless, the later you venture into the documentation of lace and bobbins, the greater evidence you can find for this beautiful and creative craft and its increasingly beautiful bobbins. Read on to learn the history of Bobbin Lace, to find patterns and how-to videos, and even read a lace maker’s pillow construction tutorial. Bobbin Lace: The Taming of Multitudes of Threads. The Digital Archive of Documents Related to Lace can be found here. It contains as many historical documents as the author could find. A visual archive of historic lace could be very important to you, if you are trying to decipher technique. If that’s the case, The Structures of Antique Lace website is just the tool for you. If you are lost or wondering how to begin, may we suggest the Learning Bobbin Lace: Where to start web page? Its comprehensive lists and starter information are perfect for your first read. In addition, there are many lace tutorials on YouTube. Most recommended by lace experts seem to be these two, from a Canadian lacemaker: Video #79 Bobbin Lace Supplies and Video #84 Beginner Bobbin Lace Tutorial. A comprehensive list of bobbin lacemaking tutorials can be found here: Lace News: lacemaking tutorials on YouTube. Although not all bobbin lace pieces are meant to be yards long of repeated patterns, there is no doubt that repeat pattern lace is the most useful for Tudor and Renaissance and later-era costomers. In order to do that, you’ll find a lacemaker’s pillow very handy with its roller to lay out your repeat pattern. Look here to figure out how to make one type: Make a Bobbin Lace-maker’s Pillow. In order to make bobbin lace, one must follow a pattern, whether for a repeated lace motif or for a single lace central figure such as the hedgehog, above. A whole bunch of them reside here: Lace patterns. Jo Edkins’ Lace School is a one-stop source of information for the beginning and intermediate lacemaker. Most helpful are the glossary of lace terms, a pictorial index of named lace patterns, 26 free bobbin lace patterns of all shapes and sizes (one is whimsically named Winkiepin Footsides, for heaven’s sake! ), and many other useful bits and links. Long considered a terrific scholar regarding bobbin lace, please visit this expert for reliable information: Bobbin Lace by Laura Cathcart. Thank You so much for this article. I am a lace maker in the Middle Kingdom and can’t count how many times someone has said something about bobbin lace being “post-SCA” period. I have also been searching for resources for my own research and yours have been very helpful. Well done!